Cloud computing is the trend nowadays. Business people and regular individuals alike are making cloud computing a part of their daily activities. Cloud critics however are so vocal about their concerns against the cloud technology specifically in the area of security. This is the reason why some most IT people who understand how vulnerable the internet is from data theft have chosen to keep their critical data in their local data servers instead of shifting them to the cloud. SEE ALSO: Benefits of Cloud Storage for Your Small Business. Data Proprietorship: Make sure you know who owns your data (hint: should be YOU), this includes the backup data as well. Storing Purposes: Make sure you know the purpose of your data in the cloud. Obviously, you are going to use it for something, but are other people going to use it as well? Would you have knowledge of their use (or misuse) of your data? Address these questions as accurately as you can. Data Access Policies: Make sure you know your cloud technology provider’s policies on data access so you don’t worry about who’s accessing your data including your backups. Data Access Logs and Statistics: Obviously, these logs and statistics aren’t your property, it is the cloud service provider’s but make sure you know what they do with these logs. Data Storage: Make sure you know where your cloud service provider is storing your data so you have knowledge of your rights in such jurisdiction as well. Data Separation: Make sure you know if your data is separated from other cloud users’ and how it is separated. Regulations Compliance: Make sure you know what are the regulations and standards that your cloud service provider adheres to. Data Transfer: Make sure you know the how your data will be transferred back to you when you need to. You should also be concerned of the form it will take when the data is delivered back to you and if your data is retained in your provider’s storage. The last part is important because you don’t want to leave your data somewhere you don’t want it to be. Such as some system tools offer History Sweeper functionalities that will swipe off your browsing history from your browser, make sure that your cloud service provider sweeps off all your data from their storage as well. Follow the three P’s of data security – Plan, Prioritize and Preserve. Planning sounds so simple but it is the most basic and probably the most important practice in cloud data security. 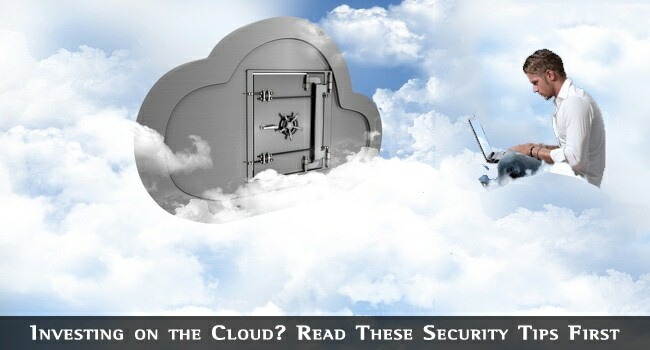 Make sure that you are able to address all the security concerns when you plan for moving your data into the cloud. Make your security strategies your top priority from the onset and preserve these strategies as you monitor your data in the cloud. IT for small businesses is available to ensure that your cloud data is secure at all times. SEE ALSO: A Cloud Migration Primer. There are cloud service providers that offer tools to protect your virtual machines aside from the basic data protection. You may think this is not important now but as more businesses move their data servers to virtual machines in a cloud setup, it’s about time to consider your virtual machine options as well. In evaluating a cloud service provider, make sure consider the following factors: compliance and auditing, invasion recognition and firewall attributes, access controls, and anti-malware features. Planning your data security is a very important activity that you should consider prior to moving your data in to the cloud. Data theft is a serious issue especially when it concerns confidential information regarding your business. I really fancy the idea of using cloud. Like what Glenn at ViperChil said, “living in the cloud makes sense as it gives way for us to do thinks in more advance way”. I like this guest post and would love to write something similar on this blog as well soonest. Hope I can? Sure, submit your unique guest post asap.